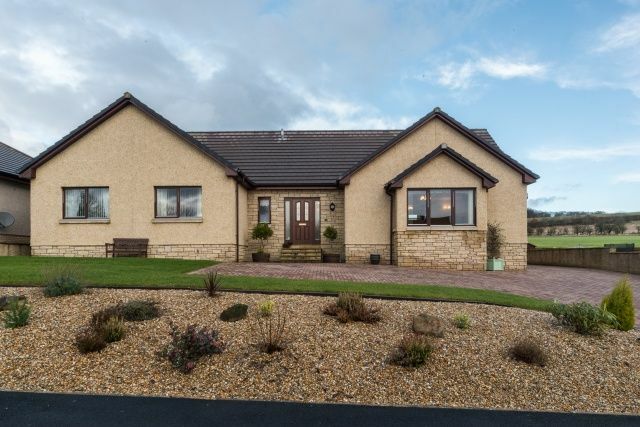 We are delighted to bring to the market this adaptable family detached home situated within a picturesque Borders town. The property briefly comprises entrance hall, bright and airy lounge to the front aspect featuring a box bay window, fully fitted kitchen with integrated kitchen appliances and an open plan dining area with a useful utility room which provides access to the reargarden, dining room/bedroom five, master bedroom with three piece en-suite shower room and three further double bedrooms of which two benefit from built in storage units. Externally the property has private front, side and rear garden grounds. The front of the property is mainly monoblocked and can comfortably fit four cars. To the side of the property there is a large detached garage for secure off-street parking and extra storage space and finally the rear garden is fully enclosed and well maintained by its current owners with a lovely summer house towards the back of the garden. The property further benefits from oil central heating and double glazed window units throughout to ensure a cosy yet cost effective living environment. Extras (Included in the sale): Floor coverings, blinds, light fittings and integrated kitchen appliances.